After years of constant use, the locking mechanism on uPVC door often fail, either with the door still closed, which though inconvenient is still safe or in an open position and therefore unsecure! Does this mean a new door? Not at all. We have specialised in the repair of uPVC doors since 1980, in fact we only repair doors and so will not try to sell you a new door. uPVC doors are locked by means of a multipoint lock. This is usually operated by you lifting the handle and then locking this mechanism solid via turning the key. 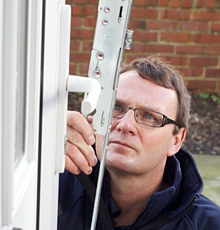 If you visit a double glazing installer with your door problem, their reply can often be that the parts required are no longer available. This could be true, but in nearly every case we will have an alternative multipoint lock in stock. The alternative lock will give you at least the same level of security, or even increase it with the upgraded version. Our specialist lock mechanism suppliers have the largest range of multipoints locks available in Europe and our mobile workshop is stocked to be able to complete 99% of call-outs on the initial visit. How can SF Locksmiths can save you money? Possibly the most important question! A new uPVC door, of reasonable quality, can cost from £700 including fitting, and up to £1200 for the higher quality doors - and possibly even more if there are side panels, windows or lead inserts. An approximate cost to replace the multipoint lock is between £130- £170. This will cover the materials and labour and includes a complete door service. If the door handles have seen better days, these can also be replaced along with the existing barrel. The charge for these will be minimal and are often incorporated into the original quote. Another major benefit is that we would expect our replacement lock fitted to your door to last approximately 10-12 years. The potential savings to our customers are therefore considerable. We appreciate that the situation can be stressful and inconvenient. SF Locksmiths operate an emergency service for the benefit of our Barnsley customers and will be able to have your door repaired often the same day you call. If you have any problems don`t panic, ring straight away there is nothing that he can`t solve.